Professor Sandra Kaji-O'Grady is an architectural educator, academic leader and researcher with a PhD in Philosophy from Monash University (2001) and professional architectural qualifications and experience. 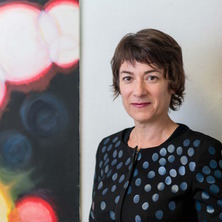 She led the design and delivering of a new progressive design education while Head of School at UTS (2005-2009) and in September 2013 commenced as Head of School and Dean of Architecture at the University of Queensland. She is committed to critical approaches to design learning and to preparing students for a radically volatile professional future. Sandra's research is in the architectural humanties and seeks to understand the political and philosophical contexts for contemporary architecture. She has recently completed a project with Chris L. Smith on the architectural expression of contemporary science and its ideologies in laboratory buildings. This research was supported by the Australian Research Council, through the Discovery Grant ‘From Alchemist’s Den to Science City: Architecture and the Expression of Experimental Science’. Laboratory Lifestyles, the first of two major book outcomes from the study, examines the history, ambitions and and effects of the addition of gymnasia, cafes, and social spaces to scientific esearch campuses and will published by MIT Press in 2018. Life science laboratories also incorporate Animal Houses and our consideration of these has led to a new research project, in its early stages. This research will explore the ways in which buildings designed to house animals evidence and determine the relationships we have with non-human animals. Previous work has been published in leading journals including the Journal of Architecture, The Journal of Architectural Education, Architecture &, and le Journal Spéciale’Z. She has presented invited lectures and peer-reviewed conference papers in the USA, Japan, Australia and New Zealand, Finland, Amsterdam, France, Belgium, Germany, England and Scotland, where she was a Visiting Fellow at the University of Edinburgh (2012). Her own artwork investigating serial systems using pianola rolls and commercial paint samples has been exhibited in Singapore and Australia. Sandra has been a member of the College of Experts of the Australian Research Council (2010-2011) and has reviewed submissions for several scholarly journals and sits on the editorial boards of Architecture and Culture, Studies in Material Thinking, Ardeth, and Architecture Theory Review. She is a reviewer for DrawingOn Journal and regularly contributes as a critic to Architecture Australia, Architecture Review Australia, Monument and Artichoke. Actively engaged with the architectural profession, she has written over fifty reviews for the design press and co-directed the AIA National Conference in 2013. The spatial organisation of animals and humans in cities and buildings has recently become a sub-theme of Animal-Human Studies through the intervention of geographers. My research builds on this emerging scholarship to examine the contributions made by architects in designing buildings to house animals across several sectors: zoos and sanctuaries; the pet industry; farming; and experimental science. Laboratory buildings, especially in the life sciences, have become as expressive in their architectural strategies, and as expensive, as museums and galleries. They are also hoped to bring about important discoveries through acting upon the scientist, encouraging them to collaborate and be entrepreneurial. Examination of their aims and performance, along with their institutional and political context, and their funding and production, offers fascinating insights into architecture and science in neoliberal economies of knowledge work. An active contributor to the architectural profession, Kaji-O'Grady co-directed with architect John de Manincor the 2013 National Conference of the Australian Institute of Architects - the peak annual event for the architecture profession in Australia with an audience of over 1400. In parallel, Kaji-O'Grady and de Manincor edited a special issue of the professional Architecture Australia focused on questions of material, the conference theme. She has published over fifty reviews of buildings and exhibitions in the design press and has been a regular member of awards juries for the Australian Institute of Architects. Kaji-O'Grady's research into the design of new facilities for scientific research is directly engaged with the profession. In 2007 this research was the subject of an ARC Linkage Grant with Industry Partner Woods Bagot and involved case study buildings by John Wardle Architects, DesignInc, Wilson Associates and LahzNimmo Architects. Her research into the expression of science in new laboratory buildings included analysis of buildings by Charles Correa, David Chipperfield, Stanton Williams, and others. Kaji-O'Grady, Sandra (2017). The architecture of constraint and forgetting. In Rowan Wilken and Justin Clemens (Ed. ), The afterlives of Georges Perec (pp. 171-188) Edinburgh, Scotland: Edinburgh University Press. Kaji-O'Grady, Sandra and Smith, Chris L. (2016). Laboratory architecture and the deep skin of science. In Katie Lloyd Thomas, Tilo Amhoff and Nick Beech (Ed. ), Industries of architecture (pp. 282-293) Abingdon, Oxon, United Kingdom: Routledge (Taylor & Francis Group). Kaji-O'Grady, Sandra (2014). Laboratories of experimental science. In Mathew Aitchison (Ed. ), The architecture of industry: changing paradigms in industrial building and planning (pp. 109-134) Farnham, Surrey, United Kingdom: Ashgate Publishing. Far from home: military mortuart practice and reconciliation. This project examines the design of environments to house animals for purposes that range from companionship to species preservation, from entertainment to food. There are numerous topics to be pursued given the wide range of typologies, including zoos, sanctuaries. vivaria, veterinary clinics, pet boarding kennels, stables, farms and slaughterhouses. I am interested in historical and theoretical perspectives on the architecture of animals, and in mining the rich body of scholarship that constitutes the field of Animal Studies. Peter Sloterdijk has argued that our relationship to air changed fundamentally with the gas wars of the early twentieth century and the advent of the air-conditioned building. This research project will draw from his arguments and other key theorists to study the myriad ways in which air and atmosphere have been of architectural concern—metaphorically and through environmental engineering—in the twentieth and twentieth centuries. Laboratory lifestyles: the construction of scientific fictions. Edited by Sandra Kaji-O'Grady, Chris L. Smith and Russell Hughes Cambridge, MA USA: The MIT Press, 2018. Kaji-O'Grady, Sandra L. Critical studies in contemporary architecture. Geelong, VIC, Australia: Deakin University, 1998. Hughes, Russell, Kaji-O'Grady, Sandra and Smith, Chris L. (2018). Lifestyle science: its origins, precepts, and consequences. In Sandra Kaji-O'Grady, Chris L. Smith and Russell Hughes (Ed. ), Laboratory lifestyles: the construction of scientific fictions (pp. 1-28) Cambridge, MA USA: The MIT Press. Kaji-O'Grady, Sandra (2018). Scientific dining. In Sandra Kaji-O'Grady, Chris L. Smith and Russell Hughes (Ed. ), Laboratory lifestyles: the construction of scientific fictions (pp. 123-145) Cambridge, MA USA: The MIT Press. Kaji-O'Grady, Sandra (2016). Accounting for Kairuz. In Eduardo Kairuz (Ed. ), Dismantled (pp. 164-187) Fitzroy, Australia: Uro Publications. Kaji-O’Grady, Sandra (2016). Building knowledge. In This building likes me (pp. 218-219) Fisherman's Bend, VIC, Australia: Thames and Hudson. Kaji-O'Grady, S. (2016). Vo Trong Nghia and the Primitive Hut. In Fugitive stories (pp. 17-25) Paddington, NSW, Australia: Sherman Contemporary Art Foundation. Kaji-O'Grady, Sandra and Smitheram, J. (2012). Critical Utopia: Site of Reversible Density, Yoro. In Hilde Heynen, Jean-Louis Genard and Tahl Kaminer (Ed. ), Critical tools : International colloquium on architecture and cities #3 (pp. 115-126) Bruxelles, Belgium: La Lettre Volee. Kaji-O'Grady, Sandra (2011). Seriature. In Dorian Wiszniewski (Ed. ), Architecture and series (pp. 6-9) Edinburgh, United Kingdom: Architecture, School of Arts Culture and Environment, University of Edinburgh. Kaji-O'Grady, Sandra (2010). From theory to practice: 39 opinions. In Anthony Williams, Michael J. Ostwald and Hedda Haugen Askland (Ed. ), Creativity, design and education: theories, positions and challenges (pp. 79-82) Sydney, NSW, Australia: Australian Learning & Teaching Council. Kaji-O'Grady, Sandra (2009). Public art and audience reception: theatricality and fiction. In Steffen Lehman (Ed. ), Back to the city. Strategies for informal urban design: collaboration between artists and architects (pp. 108-113) Ostfildern, Germany: Hatje Cantz. Kaji-O'Grady, Sandra (2009). Serial techniques in the arts: general ambitions and particular manifestations. In John P. Macarthur and Andrew Leach (Ed. ), Architecture, disciplinarity and the arts (pp. 123-134) Ghent, Belgium: A & S Books (University of Ghent). Kaji-O'Grady, Sandra (2008). Designing a practice: the emergence of a multi-office global practice. In Philip Sutton Cox (Ed. ), Cox Architects and Planners 1960-2010: three eras (pp. 34-41) Melbourne, VIC, Australia: Images Publishing. Kaji-O'Grady, Sandra (2006). Architectural models: literally and metaphorically. In Nik Karalis, Steven Cornwell, Ross Donaldson, David Tregoning and Lucy Moloney (Ed. ), Public #1 : spatial tactics (pp. 284-291) South Melbourne, VIC Australia: Woods Bagot Research Press. Kaji-O'Grady, Sandra (2006). Untitled. In Alex Selenitsch: Open and Closed (pp. *-*) Burwood, VIC, Australia: ICON Museum of Art, Deakin University. Kaji-O'Grady, Sandra (2005). Public art and crime. In Steffen Lehman (Ed. ), Absolutely public : crossover: art and architecture (pp. 50-55) Mulgrave, VIC Australia: The Images Publishing Group Pty Ltd.
Kaji-O'Grady, Sandra (2002). Op Art in the abyss of design. In Good vibrations: the legacy of Op Art in Australia (pp. 16-19) Melbourne, VIC, Australia: Heide Museum of Modern Art. Kaji-O'Grady, Sandra (2000). The serial underside of structuralism: Boulez, Levi-Strauss, Eco, Eisenman and Fujii. In Michael J. Ostwald and R. John Moore (Ed. ), Re-framing architecture: theory, science and myth (pp. 87-100) Sydney, NSW, Australia: Archadia Press. Kaji-O'Grady, Sandra (2018) Philanthropy, investment and the pecuniary architecture of bioscience laboratories. ARDETH, 3 25-50. Stead, Naomi and Kaji-O'Grady, Sandra (2018) Dossier - research in large practice. Architecture Australia, 4: 61-70. Kaji-O'Grady, Sandra (2017) Australian exports. Architecture Australia, 106 4: 49-50. Kaji-O'Grady, Sandra (2017) Career trajectories. Architecture Australia, 106 2: 68-68. Kaji-O’Grady, Sandra (2016) Stress test: addressing mental illness at architecture school. ArchitectureAU, . Kaji-O’Grady, Sandra (2016) Apocalypse now? Designing self-sufficient housing. ArchitectureAU, . Kaji-O’Grady, Sandra (2016) Bamboo Beginning: Green Ladder. ArchitectureAU, . Kaji-O’Grady, Sandra (2016) The Enduring Myth of the ‘Australian’ Architect. ArchitectureAU, . Kaji-O'Grady, Sandra (2016) Green Ladder. Architecture Australia, 105 2: 31-34. Kaji-O’Grady, Sandra (2016) Private air: “bubble” architecture’s ominous return. ArchitectureAU, . Kaji-O’Grady, Sandra (2015) Shaping the city, one parcel at a time. ArchitectureAU, . Kaji-O’Grady, Sandra (2015) A Marred Portrait: Swanston Square. ArchitectureAU, . Kaji-O’Grady, Sandra (2015) We must not Forsake Public Space for an Architecture of Fear. ArchitectureAU, . Kaji-O'Grady, Sandra (2015) Swanston Square. Architecture Australia, 104 5: 28-34. Kaji-O’Grady, Sandra (2015) Vox pop: the problem with university rankings. ArchitectureAU, . Kaji-O'Grady, Sandra (2015) Melbourne School of Design. Architecture Australia, 104 1: 22-32. Kaji-O’Grady, Sandra (2014) Does Motherhood and Architecture equal no career. ArchitectureAU, . Kaji-O’Grady, Sandra (2014) Platform: Kevin O’Brien. Architecture Australia, 103 4: 110-112. Kaji-O'Grady, Sandra (2014) Soheil Abedian School of Architecture. Architectural Review Asia Pacific, 1 134: 74-81. Kaji-O'Grady, Sandra (2013) New developments in architectural materials. Architecture Australia, 102 3: 61-63. Sandra Kaji-O'Grady (2012) Champions of change: observations from research. Architecture Bulletin, 10-11. Kaji-O'Grady, Sandra (2012) Lyons: more or less. Architecture Australia, 101 4: 85-85. Kaji-O'Grady, Sandra (2012) The spaces of experimental science. le Journal Spéciale’Z, 4 88-89. Kaji-O'Grady, Sandra (2011) Colour block: searching for meaning in monochromatic architecture. Monument, 1 106: 34-41. Kaji-O'Grady, Sandra (2011) Gehry comes to Sydney. Architecture Australia, 100 2: 16-18. Kaji-O'Grady, Sandra (2010) Lowy Cancer Research Centre. Architecture Australia, 99 3: 64-71. Kaji-O'Grady, Sandra (2010) Victor Churchill. Artichoke, 1 30: 48-52. Kaji-O'Grady, Sandra (2010) A wound to the head for undead modernism. Monument, 1 95: 33-35. Kaji-O'Grady, Sandra (2009) Artificial light. Monument, 88: 45-46. Kaji-O'Grady, Sandra (2009) SANAA: An installation by Ryue Nisizawa and Kazuyo Sejima of SANAA. Architecture Australia, 98 5: 27-28. Kaji-O'Grady, Sandra (2009) Singularly pluralist: Jane Foss Russell building, University of Sydney. Architectural Review Australia, 1 109: 104-111. Kaji-O'Grady, Sandra (2008) Where Arts and the Sciences Collide. Sydney Morning Herald, x: x-x. Kaji-O'Grady, Sandra (2008) A new Australian pavilion. Architecture Australia, 97 5: 45-47. Sandra Kaji-O'Grady (2008) The studio in the city. Object, 55: 20-23. Kaji-O'Grady, Sandra (2008) Cuts and scores 2. Singapore, WOHAGA. Kaji-O'Grady, Sandra (2008) Review of Fiona Hall, Force field. Artichoke, 23: 70-73. Kaji-O'Grady, Sandra (2007) The Field: National Awards Review. Architecture Australia, 96 6: 121-121. Kaji-O'Grady, Sandra (2007) Brisbane Girls Grammar. Architecture Australia, 96 5: 84-93. Kaji-O'Grady, Sandra (2007) Lyons Law Building. Architecture Australia, 96 4: 93-101. Kaji-O'Grady, Sandra (2007) Lamington warehouse. Architecture Review Australia, . Kaji-O'Grady, Sandra (2006) Burst 003. Architecture Australia, 95 5: 80-87. Kaji-O'Grady, Sandra (2006) The writing's on the wall. U: The Magazine of the University of Techology, Sydney, 6: 6-7. Kaji-O'Grady, Sandra (2006) Why Architecture Matters. Architecture Australia, 95 5: 18-18. Sandra Kaji-O'Grady (2006) Adding to the Opera House. Architecture Australia, 95 3: 53-57. Kaji-O'Grady, Sandra (2006) Future fast. U: Magazine, 2: 11-11. Kaji-O'Grady, Sandra (2006) L5. Architecture Australia, 95 2: 88-95. Kaji-O'Grady, Sandra (2006) Architectural academia. Architecture Bulletin, 4-5. Kaji-O'Grady, Sandra (2006) Melbourne versus Sydney. Architectural Theory Review, 11 1: 60-72. Kaji-O'Grady, Sandra (2005) Mastering architecture. Architecture Australia, 94 2: 31-32. Kaji-O'Grady, Sandra (2005) The Helen Lempriere National Sculpture Award. Artichoke, 11: 118-121. Kaji-O'Grady, Sandra (2004) National Emergency Service Memorial. Architecture Australia, 93 5: 58-59. Kaji-O'Grady, Sandra (2004) Spolia: found objects in contemporary architecture. Architectural Review Australia, 91: 110-115. Sandra Kaji-O'Grady (2004) Untitled: Genius. Subaud Magazine, 5: . Kaji-O'Grady, Sandra (2003) Review of Mark Taylor (ed.) Surface Consciousness. Architecture Australia, 92 6: 46-48. Kaji-O'Grady, Sandra (2003) Westgate Bridge Memorial Park. Architecture Australia, 92 5: 44-47. Kaji-O'Grady, Sandra (2003) Arts and the iconic. Architecture Australia, 92 1: 37-43. Kaji-O'Grady, Sandra (2003) Surfaces of painting and architecture. Projects One, . Kaji-O'Grady, Sandra (2002) (FAB12_2_019) National identity at Arakawa & Gins’ Site of Reversible Destiny—Yoro, Japan. Fabrications : The Journal of the Society of Architectural Historians, Australia and New Zealand, 12 2: 19-34. Kaji-O'Grady, Sandra (2002) Questioning image. Artichoke, 2 2: 28-37. Kaji-O'Grady, Sandra (2002) University Square and the Sidney Myer Asia Centre: A Critical Review of New Campus Architecture in Parkville. Melbourne University Magazine, 7-9. Kaji-O'Grady, Sandra (2001) (FAB11_2_003) Authentic Japanese architecture after Bruno Taut: the problem of eclecticism. Fabrications : The Journal of the Society of Architectural Historians, Australia and New Zealand, 11 2: 1-12. Kaji-O'Grady, Sandra (2001) Decoration and artifice. Architecture Australia, 90 4: 72-75. Kaji-O'Grady, Sandra (2001) Plastic extrusions. Architecture Australia, 90 4: 62-64. Kaji-O'Grady, Sandra (2001) Doctors orders. Architectural Review Australia, 77: 80-83. Kaji-O'Grady, Sandra (2000) Art & life. Architecture Australia, 89 5: 98-101. Kaji-O'Grady, Sandra (2000) Scanning the cosmos. Architecture Australia, 89 2: 46-49. Sandra Kaji-O'Grady (1997) Postmodern architectures. Postmodernism, . Sandra Kaji-O'Grady (1996) Book Review: Thinking Architecture: Theory in the Work of Australian Architects. Exedra: Architecture, Art and Design, 6 2: 58-59. Sandra Kaji-O'Grady (1996) Primitive borrowing: the work of Simon Thornton. Exedra: Architecture, Art and Design, 6 2: 32-37. Unquiet darkness: institutions, information and dissimulation at the cold spring harbour laboratory. Kaji-O'Grady, Sandra and Smith, Chris L. (2015). Unquiet darkness: institutions, information and dissimulation at the cold spring harbour laboratory.. In: Paul Hogben and Judith O'Callaghan, Architecture, Institutions and Change. SAHANZ 2015: Architecture, Institutions and Change, Sydney, Australia, (290-299). 7-10 July 2015. Kaji-O'Grady, Sandra (2014). Translating and representing bioscience through architecture. In: Christoph Schnoor, Translation: The 31st Society of Architectural Historians, Australia and New Zealand (SAHANZ) Annual Conference. Society of Architectural Historians, Australia and New Zealand (SAHANZ) Annual Conference, Auckland, New Zealand, (471-484). 2-5 July 2014. Kaji-O'Grady, Sandra (2012). Collaboration and transparency in the architecture of contemporary science. In: Stuart King, Anuradha Chatterjee and Stephen Loo, Fabulation: Myth, Nature, Heritage: The 29th Society of Architectural Historians, Australia and New Zealand (SAHANZ) Annual Conference. Society of Architectural Historians, Australia and New Zealand (SAHANZ) Annual Conference, Launceston, Tasmania, (492-511). 5-8 July 2012. Kaji-O'Grady, Sandra (2011). Environment bubbles: architecture, medicine and media. In: Antony Moulis and Deborah van der Plaat, Audience: The 28th Society of Architectural Historians, Australia and New Zealand (SAHANZ) Annual Conference. Society of Architectural Historians, Australia and New Zealand (SAHANZ) Annual Conference, Brisbane, Australia, (). 7-10 July 2011. Russell, Adam, King, Simeon, Kaji-O'Grady, Sandra and Edwards, Deborah (2010). Mapping Ultimo: Sydney for sustainable tourism. In: Mohsen Aboutorabi and Andreas Wesener, Proceedings of the International Conference Urban Design Research: Method and Application. Urban Design Research: Method and Applications, Birmingham, United Kingdom, (149-164). 3-4 December 2009. Kaji-O'Grady, Sandra (2008). Challenges for architectural history and criticism: the super-sized office and the transdisciplinary studio. In: David Beynon and Ursula de Jong, History in Practice: The 25th Society of Architectural Historians, Australia and New Zealand (SAHANZ) Annual Conference. Society of Architectural Historians, Australia and New Zealand (SAHANZ) Annual Conference, Geelong, VIC, Australia, (1-13). 3-6 July 2008. Kaji-O'Grady, Sandra (2008). Unknown. In: CV08: Future Visions: RAIA National Conference, Sydney, NSW, Australia, (). 11 April 2008. Margalit, Harry, Heneghan, Tom, Kaji-O'Grady, Sandra and Ostwald, Michael (2007). Panel 2. Heads of architecture: designing architecture education. In: International Conference on Design Education (ConnectED2007), Sydney, NSW, Australia, (). 11 July 2007. Kaji-O'Grady, Sandra (2007). The Solipsism of Serial Arts. In: George E. Lasker and Ana Luz, Systems research in the arts and humanities. Symposium on Systems Research in the Arts and Humanities, Baden-Baden, Germany, (). July 29-Aug 4, 2007. Kaji-O'Grady, Sandra (2007). The dramatisation of 'eco-technologies' in recent high-rise towers. In: Kristen Orr and Sandra Kaji-O'Grady, Techniques and Technology, Transfer and Transformation: The Proceedings of the 4th International Conference of the Association of Architecture Schools of Australasia. 4th International Conference of the Association of Architecture Schools of Australasia: Techniques and Technology, Transfer and Transformation, Sydney, NSW, Australia, (1-6). 27-29 September, 2007. Kaji-O'Grady, Sandra (2007). The solipsism of serial arts. In: George E. Lasker and Ana Luz, 1st Symposium on Systems Research in the Arts and Humanities "On Choreographies in Music, Visual and Performing Arts, and Environmental Design. Collective Choreography of Space: Modelling Digital Co-Presence in a Public Area, Baden-Baden, Germany, (1-5). 3 July - 1 August 2007. Kaji-O'Grady, Sandra (2006). Larrikins and landscape: the quest to be the most Australian city. In: P. Magee, Cultural Studies Association of Australia. UNAustralia: Cultural Studies Association of Australasia Annual Conference, Canberra, ACT, Australia, (1-11). 6-8 December 2006. Kaji-O'Grady, Sandra (2006). Mimics and the maximised city. In: 15th Biennale of Sydney 2006: Zones of Contact. June Symposium: Biennales, Cosmopolitanism and Locality, Sydney, NSW, Australia, (). 9-10 June 2006. Kaji-O'Grady, Sandra (2006). Mimics: art, architecture and the look of commerce. In: Terrance McMinn, John Stephens and Steve Basson, Proceedings: Society of Architectural Historians, Australia and New Zealand. XXIII Annual Conference 2006. SAHANZ 2006: Contested Terrains. SAHANZ 2006: 23rd Annual Conference of the Society of Architectural Historians, Australia and New Zealand, Fremantle, WA, Australia, (267-274). 29 September-2 October 2006. Kaji-O'Grady, Sandra (2006). The pragmatics of Gehry's gesture: properties and procedures. In: AAH Association of Art Historians 32nd Annual Conference. Art and Art History: Contents. Discontents. Malcontents. Programme Book. The 32nd AAH Annual Conference: 'Contents. Discontents. Malcontents', Leeds, UK, (). 5-7 April, 2006. Kaji-O'Grady, Sandra (2005). Architecture as performance art: the collaboration between Rosalie Goldberg and Bernard Tschumi. In: Kathi Holt-Damant and Paul Sanders, Association of Architecture Schools of Australasia Annual Conference (AASA). Third International Conference of the Association of Architecture Schools of Australasia, Brisbane, QLD, Australia, (1-8). 28-30 September 2005. Kaji-O'Grady, Sandra (2005). The London Conceptualists: architecture and conceptual art in the 1970s. In: Les Collections electroniques. Repenser les limites: l'architecture a travers l'espace, le temps et les disciplines, Paris, France, (). 31 August - 3 September 2005. Sandra Kaji-O'Grady (2004). A thousand words: conceptual art and architecture. In: The 1970s: Designing Futures, Community and Technology in Architecture and Urban Design, International Symposium, Melbourne, VIC, Australia, (). 23 September 2004. Kaji-O'Grady, Sandra (2004). Architecture and the future in the philosophical writings of Virilio and Flusser. In: CongressCATH 2004: The Architecture of Philosophy/The Philosophy of Architecture, Bradford, United Kingdom, (). 9-11 July 2004. Kaji-O'Grady, Sandra (2004). The look of information: conceptual art, computers and architecture in the 1970s. In: Harriet Edquist and Hélène Frichot, Limits: Proceedings of the 21st Annual Conference of the Society of Architectural Historians, Australia and New Zealand. SAHANZ 2004: 21st Annual Conference of the Society of Architectural Historians, Australia and New Zealand, Melbourne, VIC, Australia, (251-256). 26-29 September, 2004. Kaji-O'Grady, Sandra (2003). Constrictive procedures in architectural design: the Oulipian example. In: Clare Newton, Sandra Kaji-O'Grady and Simon Wollan, Design + Research: project based research in architecture, second international conference of the Association of Architecture Schools of Australia,. Second International Conference of the Association of Architecture Schools of Australasia (AASA), Melbourne, VIC, Australia, (). 2003. Kaji-O'Grady, Sandra (2003). Divergent accounts of architectural progress: Virilio and war, Flusser and the factory. In: M. Gusheh and Naomi Jean Stead, 20th Annual Conference of the Society of Architectural Historians Australia and New Zealand. 20th Annual Conference of the Society of Architectural Historians, Australia and New Zealand: SAHANZ Progress 2003, Sydney, Australia, (163-167). 3-6 October 2003. Kaji-O'Grady, Sandra (2003). Hiromi Fujii and serialism, contribution and confusion: architecture and the influence of other fields of inquiry. In: Scott Poole and Pia Sarpaneva, Contribution and Confusion Architecture and the Influence of Other Fields of Inquiry. 91st ACSA International Conference, Helsinki, Finland, (439-451). 27-30 July 2003. Kaji-O'Grady, Sandra (2002). From stroll garden to stumble park: mapping Japan at site of reversible destiny. In: Samer Akkach, Third International Symposium of the Centre for Asian and Middle Eastern Architecture. Third International Symposium of the Centre for Asian and Middle Eastern Architecture, The Univeristy of Adelaide, (65-76). 4-6 July 2002. Kaji-O'Grady, Sandra (2002). Serialism in the architectural experiments of the 1960s. In: Sandra Kaji-O'Grady and Alvar Aalto Academy, Universal versus Individual: The Architecture of the 1960s. International Conference on the Research of Modern Architecture, Jyvaskyla, Finland, (38-43). 30 August-1 September 2002. Kaji-O'Grady, Sandra (2001). Authenticity and eclecticism in contemporary Japanese architecture. In: David W. Gobel and Robin B. Williams, The Second Savannah Symposium: Authenticity in Architecture. The 2nd Savannah Symposium: Authenticity in Architecture, Savannah, GA, USA, (). 15-17 February, 2001. Kaji-O'Grady, Sandra (2001). The aesthetics of meat: countering Deleuze's Bacon. In: Anthony Bond, Conducting Bodies: Affect, Sensation and Memory. Conducting Bodies: Affect, Sensation and Memory, Sydney, NSW, Australia, (). 20-22 July 2001. Kaji-O'Grady, Sandra (2000). Derrida's "countersignature": Levinas, Titus-Carmel and Tschumi. In: David Kernohan, Formulation Fabrication: The Architecture of History. Proceedings of the Seventeenth Annual Conference of the Society of Architectural Historians Australia and New Zealand. SAHANZ 2000: 17th Annual Conference of the Society of Architectural Historians, Australia & New Zealand, Wellington, New Zealand, (441-448). 13-17 November, 2000. Kaji-O'Grady, Sandra (2000). Speculating on architectural models. In: Gary T. Moore and Louise Trevillion, Proceedings of the Association of Architectural Schools of Australasia International Conference. Architecture + Education 2000, Sydney , Australia, (45-51). June 2000. Kaji-O'Grady, Sandra (1999). Temporality in Soler's Suite sans fins. In: R. Blythe, Thresholds: Papers of the 16th Annual Conference of the Society of Architectural Historians Australia and New Zealand. Thresholds: 16th Annual Conference of the Society of Architectural Historians Australia and New Zealand, Launceston, TAS, Australia, (127-133). 28th September - 1st October 1999. Kaji-O'Grady, Sandra (1998). Architectural serialism. In: Julie Willis, Philip Goad and Andrew Hutson, FIRM(ness) Commodity DE-light? Questioning the Canons: papers from the Fifteenth Annual Conference of the Society of Architectural Historians Australia and New Zealand. SAHANZ 1998: 15th Annual Conference of the Society of Architectural Historians, Australia and New Zealand, Melbourne, VIC, Australia, (133-140). 28 September-1 October 1998. Kaji-O'Grady, Sandra (1998). The children's museum. In: William Logan, University and Heritage: Proceedings of the 3rd international Seminar Forum UNESCO. University and Heritage, Melbourne and Geelong, VIC, Australia, (215-220). 4-8 October 1998. Kaji-O'Grady, Sandra (1995). Yellow: color and cowardice in the contemporary Australian city. In: Proceedings of ANZCA 1995: Australian and New Zealand Communication Association Conference. Australian and New Zealand Communication Association Conference 95: Framing Communication: Exclusions, Edges and Cores. ANZCA 1995, Perth, WA, Australia, (). 5-7 July, 1995. Design + research: project based research in architecture. Proceedings of the second International Conference of the Association of Architecture Schools of Australasia (2003) . Edited by Clare Newton, Sandra Kaji-O'Grady and Simon Wollan. The Second International Conference of the Association of Architecture Schools of Australasia, 28-30 September, 2003, Melbourne, VIC, Australia. Kaji-O'Grady, Sandra (2008) What women want is that sportscar blast. Surry Hills, NSW Australia, News Magazines Pty Ltd..
Kaji-O'Grady, Sandra (2008) Conversation: Teaching 21st Century Architecture. Kaji-O'Grady, Sandra (2007) Cuts and Scores. Sydney , Australia, DABlab, University of Technology Sydney.